Product prices and availability are accurate as of 2019-04-08 23:28:12 UTC and are subject to change. Any price and availability information displayed on http://www.amazon.com/ at the time of purchase will apply to the purchase of this product. 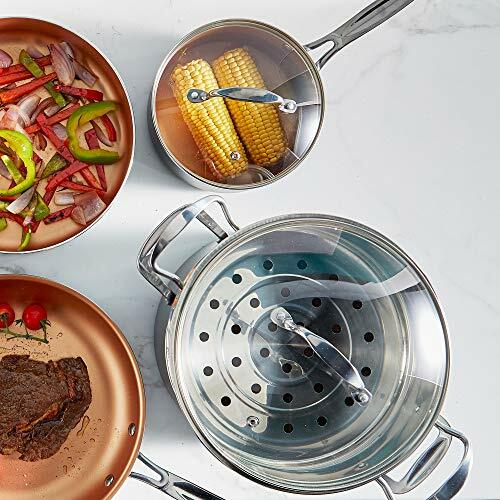 Whether you've just moved into a new house, condo or simply want to upgrade your current kitchenware, this 15pc copper pan and utensil bundle will outfit your stove with everything you need to prepare a wide range of mouth-watering meals. 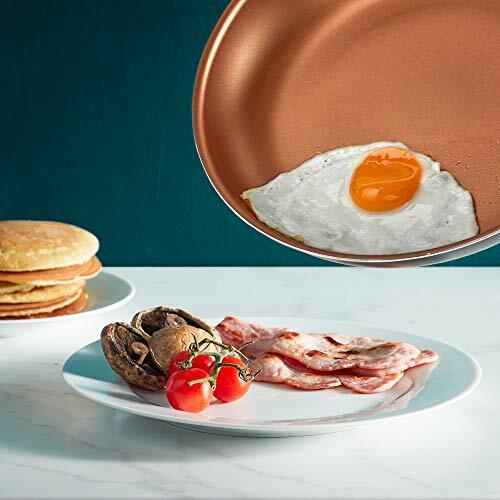 With a double layer of PFOA & PFOS-free coating on their interiors, these pans won't give food a chance to stick. 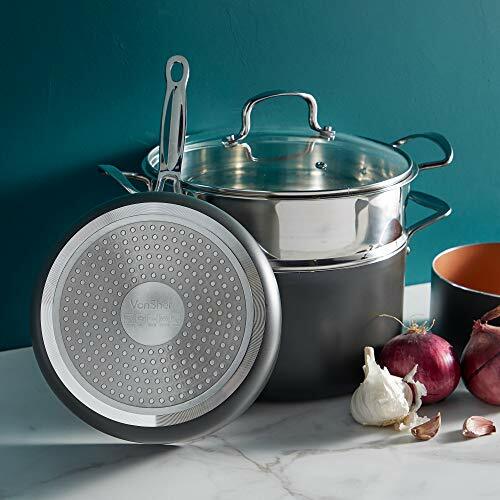 This allows you to cook healthily with little-to-no oil and makes washing up easy. Ensure a secure grip on your cookware. Complete with vents to prevent hazardous steam build-up. 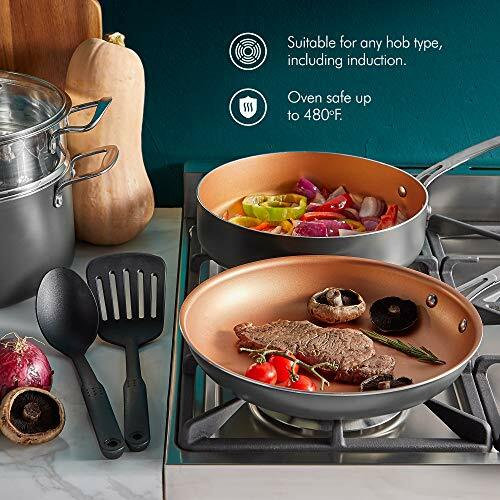 Suitable for use with any hob type, and oven safe up to 480°F, these pans are perfect for home chefs who want to utilize the power of hob-to-oven cooking. The ultra-tough aluminium body heats quickly and evenly for perfectly balanced cooking. 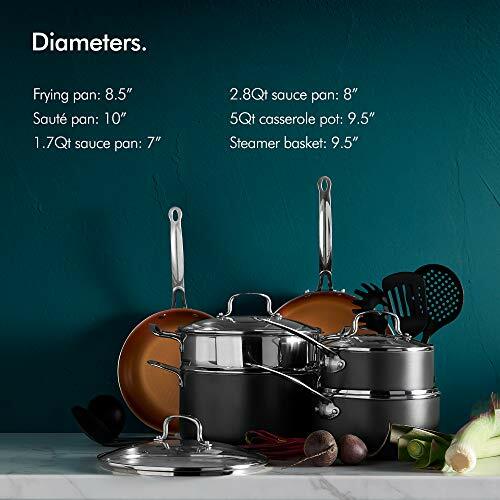 Combined with riveted steel handles and tempered glass lids, this cookware offers excellent performance and is built to stand the test of time. 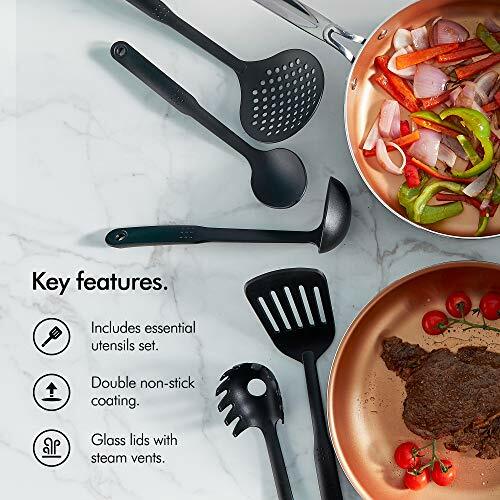 COMPLETE KITCHEN BUNDLE - ideal for new homeowners or for anyone looking to upgrade their kitchenware, this elegant 15pc copper cookware set will unleash the culinary potential of any kitchen SET INCLUDES - 8.5" frying pan, 10" sauté pan, 7" + 8" saucepans with lids, 9.5" casserole pot with steamer basket & 5 piece nylon utensil set (skimmer, spatula, ladle, solid spoon & pasta spoon) DOUBLE LAYER NON-STICK - double layer non-stick coating is extremely effective at preventing food from sticking, enabling healthy little-to-no oil cooking and making washing up easy PREMIUM BUILD - hard wearing aluminum bodies with excellent thermal conduction heat evenly to prevent hotspots, offering you precise control over your cooking VERSATILE - pans are oven safe up to 480°F and suitable for all stove types including induction - ideal for home chefs who want to explore the potential of hob-to-oven cooking.